Raasay (previously "Raasay of Melfort"): Back to Findhorn - first sail of the season. Back to Findhorn - first sail of the season. I drove up to Inverness on Saturday stopping in at Findhorn on the way to have a look at the estuary at low water - one of the lowest tides of the year, as it happens. I walked out on the sand to the furthest point on the eastern side of the estuary. The 'straight out' channel is now deeper than the old dog-leg to the west. I could see there was a foot or so of water in it, while there was a clear bank of sand blocking the western outlet. I collected the necessary GPS data to get me in - the seasonal channel bouys won't be laid for another few weeks. On Thursday I paid up in Inverness, and took the early afternoon tide under the bridge and down the firth. 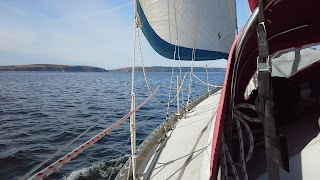 There were slight southerly winds, but I wasn't in a hurry and mostly sailed. Off Nairn bay, the wind swung round to the east - it must have been a very local effect - but otherwise I was reaching slowly or motoring. As I passed the Findhorn entrance it was low water again and I could have a look from the sea. The channel is just about on a transit made by the first and third marker posts (the middle one is west of this line). You can't follow this straight in, though, because once you're over the bar you need to turn to starboard to avoid the sandbank to the east. One of the things I picked up on Wednesday night was a waypoint about fifty metres west of the main channel just as it goes over the bar - I could see I would have to turn to starboard once I passed it. I should have checked the actual heading (I'd picked out a point on the opposite bank I'd need to steer towards). After my seaward reconnoitre I anchored near the beach in Burghead bay. In fact, I anchored opposite the point where my canoe was last seen ... On Friday morning I scanned the shoreline in case it had been uncovered. A traffic cone looked enough like it to lure me ashore in the dinghy - a long trip, as my unserviced outboard refused to start. I didn't land. I could see what I was heading for once I was thirty or forty metres from it. It seemed more canoe-ish from half a mile off. About a quarter to twelve, I lifted the anchor and headed for the entrance waypoint that I'd marked. High tide was due at about half past one, and I wanted to be going over the bar with some tide still to make, just in case. In the event, my plan worked fine. I didn't see a reading below 2.8 on the sounder (I have a .8 offset, so that's 3.6 metres), and that was only briefly. At about one o'clock I picked up a boatyard mooring. They've offered me a pontoon berth, but they're seasonal and won't be laid out for another week or so. I'll get the bus to Inverness tomorrow to pick up my car.